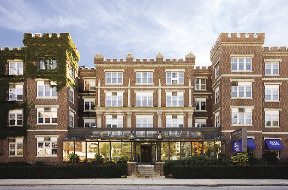 The neighborhoods surrounding Coolidge Corner are filled with beautifully designed and maintained apartment buildings, and CHR buildings are often mistaken for condominium buildings. All of our apartment buildings offer easy access to Coolidge Corner or Washington Square and are meticulously landscaped by Chestnut Hill Realty's horticulture department with a variety of vegetation, including trees, shrubs and flowers. Hampton court is just one block east of Coolidge Corner on Beacon St. Originally a landmark residential hotel, the building now includes apartments, a restaurant and medical offices. Outside the front door is a stop on the MBTA Green Line and Boston is just a short ride away. Nearby are the eclectic offerings of Coolidge Corner: ethnic foods, a famous movie theatre and unique boutiques. Built in 1900, Hampton Court fell into disrepair during its operation as the Brookline Motor Hotel. The building needed extensive renovations when Chestnut Hill Realty acquired it from the Newhall estate in 1977. The company initially spent $350,000, an amount equal to the cost of the former hotel, to convert it into 68 apartments and five doctor's suites. CHR spent more than $1 million on apartment upgrades and on the addition of the atrium entrance. As it does with all properties, CHR continually invests in Hampton Court. An extensive renovation of the common area restored it to its original grandeur. Inside the building, new carpets were installed in hallways and the fire alarm system was replaced. All of the windows in Hampton Court have been replaced to meet Brookline historical standards. The four story building has an elevator, an on-site laundry facility, and ample parking at the rear of the building.